For other uses, see Bullpen (disambiguation). When the game goes on, a relief pitcher warms up in the bullpen. Here Aaron Fultz and Rafael Betancourt warm up in the Cleveland Indians' bullpen behind the Progressive Field fence. During pregame warmup the starting pitcher will loosen up in the bullpen. 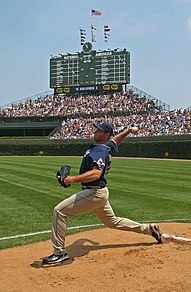 Chris Young of the San Diego Padres warms up in the former bullpen location at Wrigley Field prior to a game. This was an example of a bullpen located in foul territory on the playing field. In baseball, the bullpen (or simply the pen) is the area where relief pitchers warm-up before entering a game. A team's roster of relief pitchers is also metonymically referred to as "the bullpen". These pitchers usually wait in the bullpen if they have not yet played in a game, rather than in the dugout with the rest of the team. The starting pitcher also makes his final pregame warm-up throws in the bullpen. Managers can call coaches in the bullpen on an in-house telephone from the dugout to tell a certain pitcher to begin his warm-up tosses. Each team generally has its own bullpen consisting of two pitching rubbers and plates at regulation distance from each other. In most Major League Baseball parks, the bullpens are situated out-of-play behind the outfield fence. There are currently three MLB parks with bullpens in playable foul territory: Oracle Park, Oakland Coliseum and Tropicana Field. The origin of the term bullpen, as used in baseball, is debated, with no one theory holding unanimous, or even substantial, sway. The term first appeared in wide use shortly after the turn of the 20th century and has been used since in roughly its present meaning. According to the Oxford English Dictionary the earliest recorded use of "bullpen" in baseball is in a 1924 Chicago Tribune article from October 5. The earliest known usage of the term "bull pen" relating to an area of a baseball field is in a The New York Times article from June 24, 1883. The earliest known relief pitching related usage of "bullpen" in The New York Times is in an article dated September 18, 1912. There are numerous examples—some historical, some speculative—about the possible origin of the term bullpen. During the Civil War in the United States, the notorious Andersonville prison camp was referred to, by the inmates, as a bullpen. Though conditions were initially a vast improvement over Richmond detention centers, problems grew in proportion to the number of inmates. By late summer 1864, the prison population made Andersonville one of the largest cities in the Confederacy. At its peak in August, the "bullpen", built to lodge up to 10,000 enlisted men, held 33,000 grimy, gaunt prisoners, each one crammed into a living area the size of a coffin. Their only protection from the elements were "shebangs", hand built shelters low to the ground created by driving forked branches into the sandy soil four to eight feet apart and a piece of limb laid in the two forks creating the center pole. Planks or limbs were laid from the center pole to the ground creating what is also known as a "lean-to". The planks or limbs were covered with tent shelter halves, gum sheets, overcoats, or blankets as the owner could afford. If no woven material was available, then the shelter was covered in broad leaves giving the owner some shade but little protection from the rain. This wartime usage in the United States has occurred as recently as World War II. Tokio Yamane described conditions in Japanese relocation camps, referring to a "bull pen" within a stockade at Tule Lake, California. Prisoners in the stockade lived in wooden buildings which, although flimsy, still offered some protection from the severe winters of Tule Lake. However, prisoners in the "bull pen" were housed outdoors in tents without heat and with no protection against the bitter cold. The bunks were placed directly on the cold ground, and the prisoners had only one or two blankets and no extra clothing to ward off the winter chill. And, for the first time in our lives, those of us confined to the "bull pen" experienced a life and death struggle for survival, the unbearable pain from our unattended and infected wounds, and the penetrating December cold of Tule Lake, a God Forsaken concentration camp lying near the Oregon border, and I shall never forget that horrible experience. Temporary holding facilities for rebellious workers trying to organize into unions were referred to as bullpens. These military prisons were sometimes literally pens normally used for cattle which were pressed into service by stringing barbed wire, establishing a guarded perimeter, and keeping large numbers of men confined in the enclosed space. These "bullpens" have been considered early versions of concentration camps, and were used by the national guard during the Colorado Labor Wars of 1903-04, and in Idaho in 1892 and 1899 during union miners' uprisings near Coeur d'Alene. Author Emma Langdon described these as the first use of the bullpen in the West. ...months of imprisonment in the bull-pen, a structure unfit to house cattle, enclosed in a high barbed-wire fence. Haywood traveled to the town of Mullan, where he met a man who had escaped from the bullpen. The makeshift prison was an old grain warehouse that reeked of excrement and crawled with vermin. Overcrowding was so severe that some two hundred prisoners had been removed from the warehouse and quartered in railroad boxcars. "...a large stockade with a frame building in the center, for them to sleep and eat in." In the 1800s, jails and holding cells were nicknamed "bullpens", in respect of many police officers' bullish features – strength and a short temper. The bullpen symbolically represents the fenced in area of a "bull's pen", where bulls wait before being sent off to the slaughter. The relief pitchers are the bulls and the bullpen represents their pen. Latecomers to ball games in the late 19th century were cordoned off into standing-room areas in foul territory. Because the fans were herded like cattle, this area became known as the "bullpen", a designation which was later transferred over to the relief pitchers who warmed up there. At the turn of the century, outfield fences were often adorned with advertisements for the Bull Durham brand of tobacco. Since relievers warmed up in a nearby pen, the term "bullpen" came about. Manager Casey Stengel suggested the term might have been derived from managers getting tired of their relief pitchers "shooting the bull" in the dugout and were therefore sent elsewhere, where they would not be a bother to the rest of the team – the bullpen. How serious he was when he made this claim is not clear. Jon Miller, a baseball play-by-play announcer with ESPN television, said the term is derived from the late 19th century. The New York Giants first played at the Polo Grounds, which opened around 1880. The relief pitchers warmed up beyond the left-field fence, and in the same area was a stockyard or pen that had bulls in it. In 1913, an Ohio veteran of the Civil War contrasted a current baseball game with "a good game uv old time bull pen, the way us boys uster play it." This suggests that bullpen was the name of a game. In most major league stadiums, the bullpens are located out-of-play just behind the outfield fences. Commonly, the bullpens are separated from each other and each team's is located on the side of the field corresponding with the same team's dugout. However, there are exceptions. In a few ballparks, the team's bullpens are opposite their own dugouts which allows the manager to more easily watch the pitchers warming up from his dugout. A recent trend is the installation of mesh outfield walls in front of the bullpen to allow the bullpen to be more-easily seen by both fans and the manager in the dugout, as well as to allow the players in the bullpen to more easily see what is occurring on the field. Three major league stadiums currently have their bullpens in foul territory: Oakland–Alameda County Coliseum (Oakland Athletics), AT&T Park (San Francisco Giants), Tropicana Field (Tampa Bay Rays). This was more common in the past and most new stadiums have opted to move the bullpens to the outfield where the ongoing play is less likely to interfere with the bullpen. In parks with foul-territory bullpens, the relief pitchers and bullpen staff generally sit in chairs or benches along the wall between the field and the stands. The bullpen pitching area is in foul territory and in some of the stadiums, is right up against the foul line. It is therefore not uncommon for batted balls to head towards the bullpen requiring pitchers warming up (and even those sitting along the wall) to move to avoid interfering with a live play or being hit by the ball. There is commonly a ballboy at the end of the bullpen nearest to home plate to attempt to protect the players from foul balls hit in that direction. Certain ballparks have their outfield bullpens in unusual configurations. Petco Park features the home bullpen behind the outfield fence and the visitor's bullpen behind that and one level higher. The visitor's bullpen was moved to this location from foul territory after the 2012 season. Between 1950 and 1995, varying numbers of MLB teams used vehicles to transport pitchers from the bullpen to the mound. These bullpen cars ranged from golf carts to full-sized cars. The 1950 Cleveland Indians were the first to use a bullpen car. The last use of a bullpen vehicle was a motorcycle and sidecar used by the Milwaukee Brewers in 1995. However, the Arizona Diamondbacks and the Washington Nationals have since given relief pitchers the option of utilizing a bullpen cart in the 2018 season. Reference to a large open work area consisting of desks with no separating walls and private offices. Bullpens were common across many business fields in the first half of the 20th century and are often used by software development teams. Michael Bloomberg used this set-up and term at his media company Bloomberg L.P., and for his staff while Mayor of New York City. Adrian Fenty used this setup also while mayor of Washington, D.C. Within USAID, the Office of Transition Initiatives' bullpen represents a surge capacity of experienced professionals that can be called upon to assist in all aspect of office operations and programming. Marvel Comics refers to its in-house staff of writers and artists as the "Marvel Bullpen." ^ "Etymologies & Word Origins: Letter B". Wordorigins. Archived from the original on 2006-04-28. ^ "THE BASE-BALL SEASON" (PDF). The New York Times. June 24, 1883. – (The New York Times reporting on the Providence/New York game of June 23, 1883) "Denny drove the ball into the bull pen in the sixth inning, and would have secured a home run without the ball going outside the fence had he not stepped directly over instead of upon the bag at third base, the umpire giving him out." – retrieved March 10, 2010 – The term here refers to an area of the field that was in-play. Unstated are the specific purpose of the bullpen and whether the area was in fair or foul territory. ^ Kleiner, Carolyn. "The Demon of Andersonville" Retrieved March 19, 2007. ^ Commission on Wartime Relocation and Internment of Civilians. Personal Justice Denied "Chapter 9: Protest and Disaffection" Archived September 29, 2012, at the Wayback Machine. Washington, D.C., December 1982. Retrieved March 19, 2007. ^ Jim Kershner, Carl Maxey: a fighting life, V Ethel Willis White Books, 2008, page 25. ^ Emma Langdon, The Cripple Creek strike: a history of industrial wars in Colorado, 1903-4-5, Great Western Pub. Co., 1905, page 468. ^ Haywood, William D. The Autobiography of Big Bill Haywood, 1929, page 81. ^ Siringo, Charles (1912). A Cowboy Detective. Arcadia Press. p. 71. ISBN 9781545001882. ^ Heckle Depot. " Archived July 11, 2011, at the Wayback Machine Retrieved July 2, 2010. ^ "Ashville (OH) Home News". May 30, 1913. ^ Umminger, April; Lindeman, Todd (February 20, 2007). "Inside Fenty's Bullpen". The Washington Post. This page was last edited on 8 February 2019, at 03:26 (UTC).